On-board software and MDTs for the Emergency. SaveOnBoard® provides all tools required before, during and after an Emergency Management intervention. At a touch of a screen, professionals onboard emergency vehicles can receive and transmit relevant information related to the mission, notify mission progress status, and automatically transmit data acquired through medical apparatuses. The fleet management features allow the Emergency Communication Centre to constantly monitor teams and tasks involved in the mission, also through multimedia information flows from/to the vehicles. All this, of course, smoothly integrated with all the best navigation tools on the market. Just one product grants you professional assisted navigation, plus onboard intervention and vehicle management. More features in a simpler package! SaveOnBoard® is the result of an exceptional collaboration. 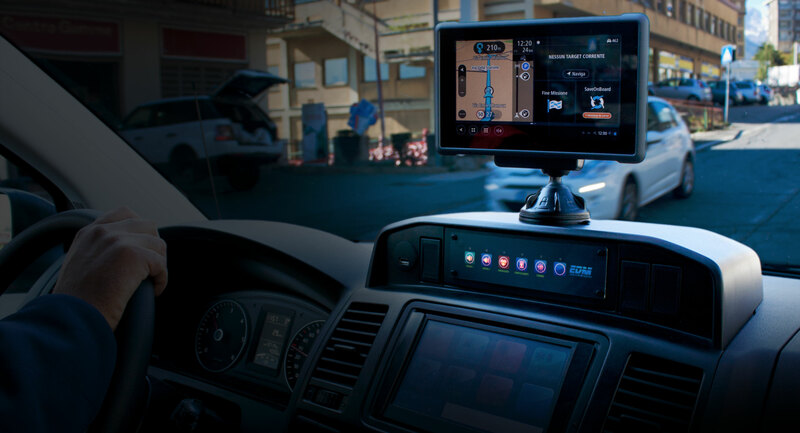 Onboard software tools designed by Regola are integrated with the navigation platform provided by TomTom professional devices, resulting in an exclusive synergy between navigation, fleet management and intervention management. Thanks to our partnership with Eurocom Telecomunicazioni and AXIS Communications, SaveOnBoard® runs on an onboard computer and it is able to outperform app-based systems in terms of speed of use, integration with onboard devices, range of available features, and customization. .
Automatic route and destination configuration. Professional satellite navigator. Real-time information on traffic conditions and specific events through constantly updated maps. Communication between vehicles and Emergency Communication Centres. Fast vehicle progress status notification. Automatic reception/transmission of intervention records and related data. Integration with onboard equipment (e.g. environmental sensors). Image, audiovisual and multimedia data exchange. Time & attendance records. Material and equipment checklist (before/after intervention). Costs and consumption measurement. Accurate GPS geolocation. Vehicle telemetry with CAN-bus support. Onboard personnel monitoring and safety. Support for medium and long term analysis. SaveOnBoard is developed by Regola S.r.l., a company boasting a long standing experience in designing Emergency systems design, team management applicationa and Command&Control platforms.